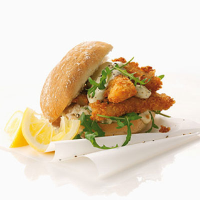 Sinking your teeth into crisp, hot, flaky fingers of fish that are nestled in spicy roquette leaves with lashings of tartare sauce, all sandwiched in a buttered fluffy white bap, is heaven. Of course, you don't have to make your own fish fingers, but it's a real treat if you do. Fish finger butty aficionados might question the choice of tartare sauce over ketchup, but it has all the necessary qualifications: sharp gherkins, minced onions and a nice bit of chunky texture which ketchup can't quite offer. Still, use a little ketchup if you must. Just don't make the foolish mistake of choosing an overly heavy bread. Now is not the time for ciabattas or sourdough. It's a squashy white bap spread with butter or nothing. First make the fish fingers. Put the flour in a bowl and season with some salt and pepper. Dip the fish strips in, then dip in another bowl containing the beaten egg so that the fingers are fully coated. Finally, roll them in a plate of breadcrumbs until they're covered. Heat a layer of oil in a frying pan and fry for 2–3 minutes each side until the fingers are golden and the fish is cooked through. Transfer to some kitchen paper to drain off the excess oil. Meanwhile, spread the bottom half of the bap with the soft butter. Pile the fish fingers on, dollop generously with tartare sauce and scatter the rocket over the top. Squeeze with some lemon and sprinkle some freshly ground black pepper over the top. Serve immediately. This recipe was first published in Wed Nov 01 00:00:00 GMT 2006.